Celebrate the Fourth of July in The Woodlands with a spectacular lineup of events providing entertainment for the whole family to enjoy! On Monday, July 3, 2017, ignite your patriotic spirit at the annual Star-Spangled Salute free concert at The Cynthia Woods Mitchell Pavilion which features the Houston Symphony performing a selection of patriotic favorites. Put on your red, white and blue and get a prime viewing spot for the exciting South County Fourth of July Parade. The 1.3-mile parade around The Woodlands features marching bands, fire engines, clowns, floats and more! Note: Roads will be closed during the parade; please view the route map for details. Cool off at one of the Township's community pools and enjoy activities from noon to 4 p.m. and free refreshments while supplies last. The lifeguards will select a special theme for each pool! All community pools will be free to residents from 10 a.m. to 6 p.m. Families are invited to parade their patriotically-decorated bike around Northshore Park. Decorating will take place beginning at 5:30 p.m. Materials will be provided while supplies last, or participants can bring their own. Judging of the most patriotic bike will begin at 7:30 p.m. during intermission. Celebrate freedom in The Woodlands with great food, live entertainment, children's activities and family fun at multiple locations around The Woodlands! The event culminates with one of the largest fireworks displays in the Greater Houston area. Enjoy a variety of activities throughout The Woodlands at the below locations! All sites will feature live music beginning at 6 p.m. with bands playing until the Fireworks Extravaganza at approximately 9:30 p.m.
Festival activities include strolling entertainers, face painters, balloon artists, inflatables, entertainment on two stages, a variety of food vendors, and a Kids' Zone featuring crafts and other family-fun games. Participants must have a wristband to enter the inflatable activities at this location. Wristbands are $10 each and good for unlimited access of the inflatables for the duration of the event. Excludes mechanical bull. Activities include face painting, balloon artist, concessions and live music. 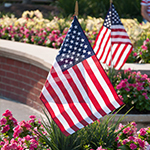 Fourth of July Parade Awards at 7 p.m.
Activities include face painting, concessions and live music. PLEASE NOTE: Northshore Park will be closed to vehicular traffic at 11:30 p.m. on July 3, 2017, and reopen at 5:30 a.m. on July 5, 2017. If attendees are going to attend the event at Northshore Park, they are encouraged to park at the AON Hewitt Campus. Residents should be advised majority of the docks at Northshore Park will be unavailable June 30 through July 5, 2017. Northshore Park will be closed from 6 to 9 a.m. on July 2, 2017 to accommodate further set up. The 18-minute Fireworks Extravaganza will take place at approximately 9:30 p.m. The primary fireworks display will be located in Lake Woodlands adjacent to Northshore Park, with secondary close-proximity (special effects) displays at Waterway Square and Town Green Park. The 2017 Fireworks Extravaganza will also feature a fireworks display near Rob Fleming Park in the Village of Creekside Park. To ensure spectators have the best fireworks visibility possible, fireworks teaser shots will be fired from all launch locations at 9, 9:10 and 9:20 p.m.